French authorities have handed preliminary charges to one of President Emmanuel Macron’s top security aides after he was captured on video allegedly beating a protester in May. The charges came after French authorities opened a judicial investigation over the alleged assault, which has sparked the first major political crisis for Mr Macron since he took office last year. A judge handed Alexandre Benalla multiple charges on Sunday night. They included violence, interfering in the exercise of public office and the unauthorised public display of official insignia. The video, made public by Le Monde newspaper on Wednesday, showed Mr Benalla apparently wearing a police helmet at the May Day protest. He is not a police officer. Four others were also charged: Vincent Crase, who worked for Mr Macron’s party and was with Mr Benalla on the day of the protest, and three police officers who were suspected of illegally passing footage from the event to Mr Benalla. Mr Crase was handed preliminary charges of violence and prohibited possession of a weapon. France’s interior minister appeared to shift blame from himself over the scandal on Monday when he told MPs he informed the presidency straight away about the video. Interior Minister Gerard Collomb, who is one of Macron’s closest allies in government, faced a grilling from politicians over the video on Monday. He said he took no further action after he showed it to the presidency the day after viewing it in May. “I considered that the facts that were flagged were being dealt with at the appropriate level, so I did not get involved further on this issue,” he said. Collomb, who said he did not know Benalla was part of Macron’s team, said he spoke to the president on May 1, but at that time was not aware of the video. 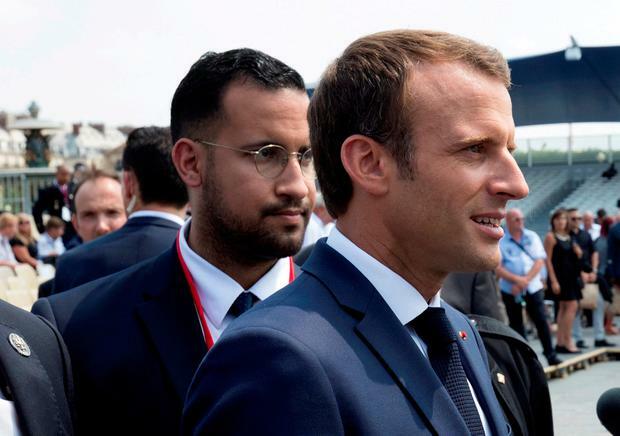 Mr Macron’s office said on Friday that it has begun dismissal proceedings against Benalla.